Aim: The aim of the study was to clinically evaluate the efficacy of acellular dermal matrix allograft [Alloderm®] in combination with coronally positioned flap in treatment of Miller's Class I or Class II isolated gingival recessions. Materials and Methods: Fifteen systemically healthy patients with Miller's Class I or Class II isolated gingival recessions participated in the study. Coronally positioned flap was performed and acellular dermal matrix allograft [Alloderm®] was placed over the defect. Clinical parameters such as recession height, recession width, keratinized tissue height, clinical attachment level, probing depth, plaque index, and gingival index were evaluated at baseline, 3 months, and 6 months post surgery. The percentage of root coverage was calculated. Descriptive statistical analysis has been carried out using Student's t-test (two-tailed, dependent) to determine the significance of study parameters on continuous scale within each group. The Statistical software namely SAS 9.2, SPSS 15.0, Stata 10.1, MedCalc 9.0.1, Systat 12.0, and R environment ver. 2.11.1 were used for data analysis. Results: In the study, the recession height decreased from the baseline of 2.50 ± 0.53 mm to 0.3 ± 0.48 mm at 3 months and remained unchanged after 6 months with percentage of reduction being 89%; recession width decreased from the baseline of 4.10 ± 0.74 mm to 0.7 ± 0.95 mm after 3 months and to 0.4 ± 0.52 mm after 6 months (91%), increase in the keratinized tissue height (KTH) from the baseline of 3.6 ± 0.70 mm to 4.7 ± 0.67 mm after 3 months and further increased to 6.4 ± 0.52 mm after 6 months (64%) and gain in CAL from baseline of 4 ± 0.82 mm to 1.9 ± 1.2 mm after 3 months and further reduced to 1.4 ± 0.52 mm after 6 months (74%). There was statistical difference in all the parameters indicating good percentage of root coverage. 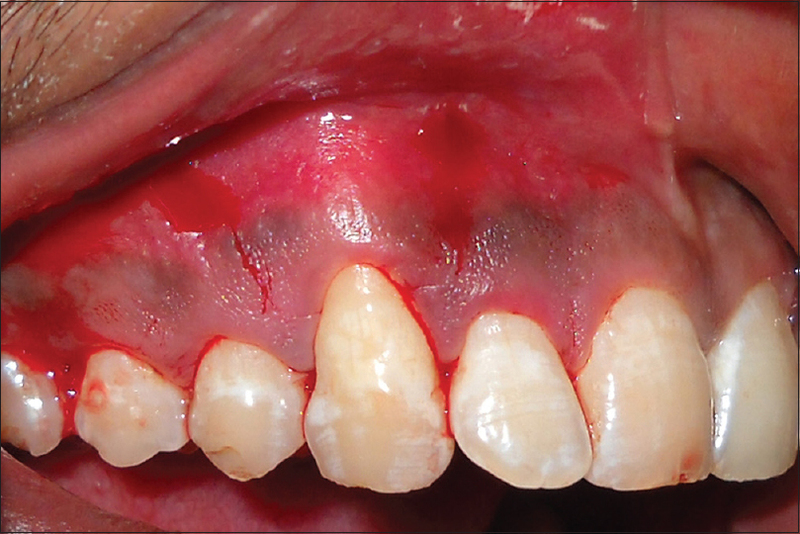 Conclusion: The use of Alloderm® along with coronally positioned flap provided significant improvement in all measured clinical parameters, indicating that graft gives favorable results in treating Miller's Class I or Class II isolated gingival recessions. 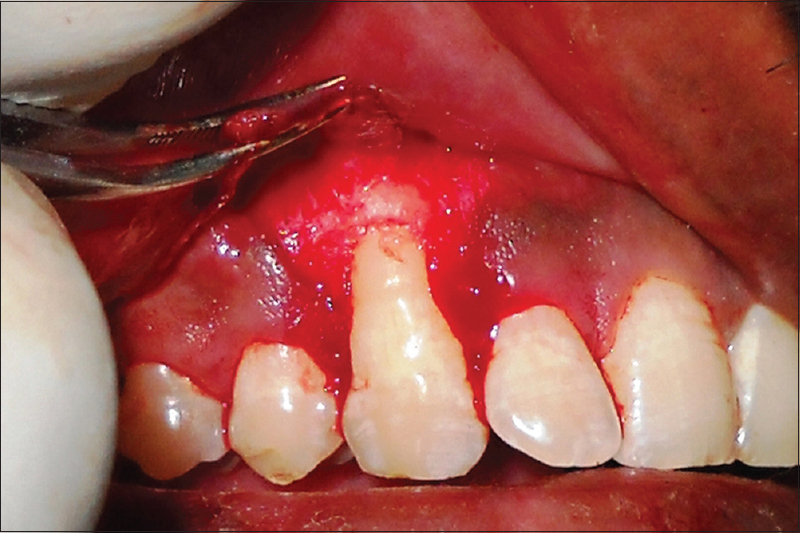 Keywords: Acellular dermal matrix allograft, coronally positioned flap, gingival recession. Several techniques have been used for root coverage, such as free gingival grafts, guided tissue regeneration, subepithelial connective tissue grafts; lateral sliding flaps, double papilla flaps, and coronally positioned flaps. Among these procedures, the subepithelial connective tissue grafts is considered the gold standard because it has high predictability for root coverage and increases the width of keratinized tissue. One disadvantage of the procedure is the morbidity associated with the second surgical site needed to harvest the autogenous palatal donor tissue. An additional site may be required to harvest the donor graft tissue. With the availability of an alternative source of donor tissue, less surgery would be necessary and the potential morbidity could be reduced. The present study evaluates the efficacy of acellular dermal matrix allograft [Alloderm ®] with the coronally positioned flap in the treatment of Miller's Class I or Class II isolated gingival recession. The study population comprised 15 systemically healthy male and female patients aged 18–40 years with isolated Miller's class I or Class II gingival recessions. The exclusion criteria included smokers, periodontal surgery in the last 6 months in the involved site, medically compromised patients, generalized lingual or palatal recession, malpositioned teeth and presence of caries, restoration and cervical abrasion. Written informed consent was obtained after explaining the surgical procedure to the patients, and the study was approved by the Institutional Ethical Committee. All the clinical parameters were recorded using the UNC-15 probe, at baseline, 3 months, and at 6 months. The following clinical parameters were recorded: plaque index and gingival index, recession height (RH) measured from mid-point of cementoenamel junction (CEJ) to gingival margin apicocoronally [Figure 2]; recession width (RW) measured at the widest point, i.e., the distance between the mesial gingival margin and the distal gingival margin of the tooth at the level of CEJ; probing depth (PD) measured from the gingival margin to the base of the sulcus; clinical attachment level (CAL) Measured from CEJ to the base of the sulcus; keratinized tissue height (KTH) measured at the mid-buccal point from the gingival margin to the mucogingival junction. Each participant completed the initial therapy consisting of oral hygiene instructions, scaling, root planing, and polishing. Following reevaluation after Phase I therapy, surgical procedure was carried out. The surgical procedure was performed under local anesthesia with 2% lignocaine hydrochloride containing adrenaline at a concentration of 1:1,00,000. An intrasulcular incision was made at the buccal aspect of the involved tooth. Two horizontal incisions were made at right angles to the adjacent interdental papillae, at the level of the CEJ, without interfering with the gingival margin of the neighboring teeth [Figure 3]. 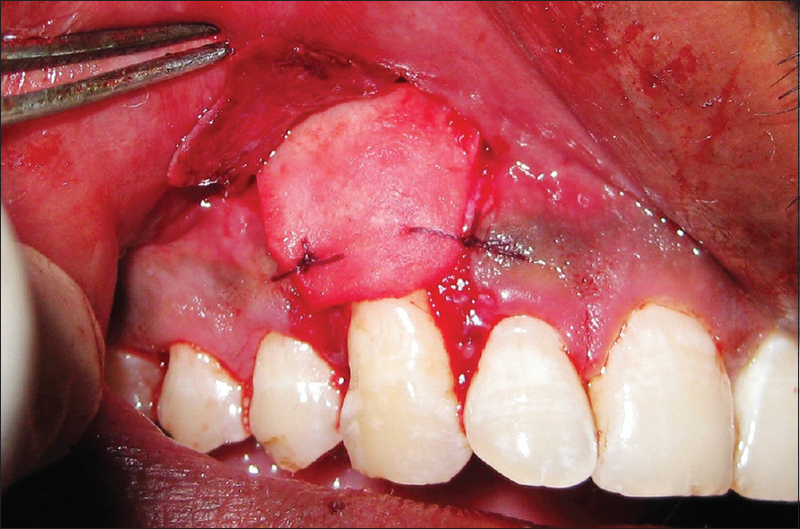 Two oblique vertical incisions were extended beyond the mucogingival junction, and a trapezoidal partial thickness flap was raised and extended apically beyond the mucogingival junction, releasing the tension and favoring the coronal positioning of the flap. The epithelium on the adjacent papillae was de-epithelized. The root surface was instrumented with curettes and washed with sterile saline solution [Figure 4]. Alloderm graft was adapted after being aseptically rehydrated in sterile saline, according to the manufacturer's instructions. The graft was trimmed to the shape and size designed to cover the root surface and the surrounding bone. The connective tissue side was placed adjacent to bone and tooth and the basement membrane side was placed facing the flap [Figure 5] and [Figure 6]. The coronal lateral borders of the acellular dermal matrix were sutured to the adjacent gingival tissue with resorbable sutures (4-0 bioabsorbable suture (VICRYL ™, Johnson and Johnson). The flap was coronally positioned and sutured to completely cover the allograft with a 4-0 silk suture [Figure 7]. NonEugenol periodontal dressing (Coe – Pak ™, GC) was placed over the surgical site. All patients were instructed to discontinue tooth brushing around the surgical site for the first 3 weeks after the surgery. During this period, patients were advised to use 0.2% chlorhexidine solution twice daily for 4 weeks. Systemic antibiotics and analgesics were prescribed for 7 days post surgically (Amoxicillin 500 mg t.i.d). The sutures were removed after 14 days. One month after the surgery, the patients were instructed to resume careful mechanical tooth cleaning of the treated areas using a soft bristled tooth brush. Patients were given instructions to report to the department if they had any discomfort following surgery. All patients were periodically recalled every month for evaluation. The clinical parameters were measured during the follow-up visit at 3 months and at 6 months [Figure 8]. Descriptive statistical analysis has been carried out in the present study. Results on continuous measurements are presented on Mean ± SD (Min–Max) and results on categorical measurements are presented as number (%). Significance is assessed at 5% level of significance. Student's t-test (two-tailed, dependent) has been used to find the significance of study parameters on continuous scale within each group. Fifteen patients aged between 20–40 years participated in the study. There were no drop outs during the study period. The surgical areas were analyzed in relation to RH, RW, probing depth; CAL, and KTH with a standard UNC-15 probe, and the measurements were rounded off to the nearest 0.5 mm. Healing was uneventful in all patients. Postoperative follow-up was done at 3 months and 6 months [Table 1]. At baseline, the mean RH was 2.50 ± 0.53 mm which decreased to 0.3 ± 0.48 mm at 3 months and remained unchanged at 6 months with the percentage of reduction being 89% at 3 months and 6 months. The decrease in recession depth was highly significant from the baseline to 3 months and 6 months. At baseline, the mean RW was 4.1 ± 0.74 mm which decreased to 0.7 ± 0.95 mm at 3 months and further decreased to 0.4 ± 0.52 mm at 6 months with the percentage of reduction being 85% at 3 months and 91% at 6 months. The mean probing depth at baseline was 1.5 ± 0.53 mm which reduced to 1.3 ± 0.48 mm after 3 months which was not significant. From 3 months to 6 months, there was slight reduction to 1.1 ± 0.32 mm which was statistically significant. The mean CAL at baseline was 4.00 ± 0.82 mm, which reduced significantly to 1.9 ± 1.2 mm at 3 months. The percentage change from the baseline to 3 months was 68%. The mean CAL reduced from baseline to 6 months to 1.4 ± 0.52 mm. The percentage change from the baseline to 6 months was 74%, which was highly significant. The mean KTH at baseline was 3.6 ± 0.70 mm. At 3 months, the KTH increased to 4.7 ± 0.67 mm and at 6 months it was further increased to 6.4 ± 0.52 mm. The percentage of change in KTH from baseline to 3 months was 57% and the percentage change of KTH from baseline to 6 months was 64%, which was highly significant. Gingival recession may lead to dentinal hypersensitivity, pain, difficultly in maintaining oral hygiene, root caries, unaesthetic gingival appearance, and loss of attachment. Therefore, root coverage procedures have been developed to treat these clinical conditions. There are different modalities of treating gingival recession such as lateral sliding flap, double papillae flap, coronally advanced flaps, epithelialized gingival grafts, subepithelial connective tissue graft, and guided tissue regeneration. The coronally repositioned flap was a less technique sensitive than rotational flaps. It also eliminates the need to harvest donor tissue and minimizes donor site morbidity. CAF have been shown 75–82.7% with 24–95% sites of predictable root coverage. 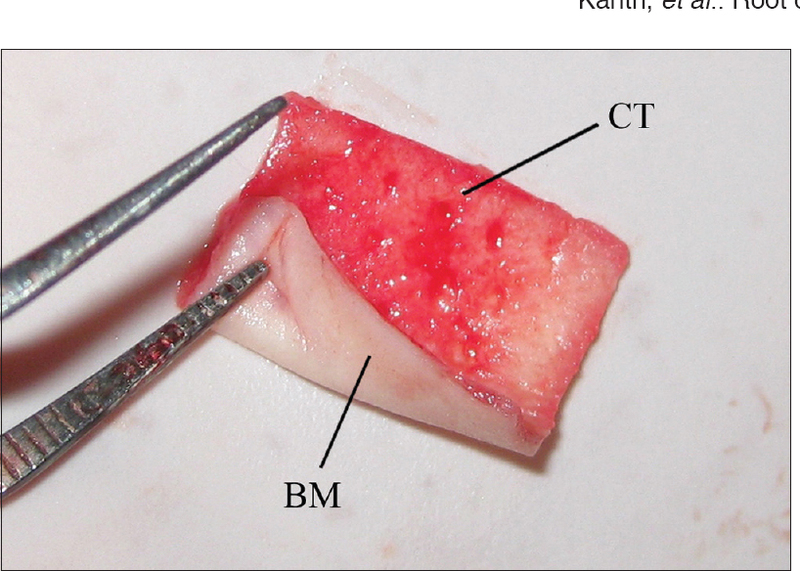 Acellular dermal matrix graft obtained from human skin was introduced as a substitute for autogenous connective tissue to increase the width of keratinized tissue around teeth or implants, alveolar ridge deformities, root coverage procedures, depigmentation, and also used as a barrier membrane in guided bone regeneration. Alloderm was originally developed for the treatment of full thickness burn wounds and was also used for revision of depressed scars, nasal reconstruction, facial defect repair, septal perforation repair, and parotidectomy defect repair. 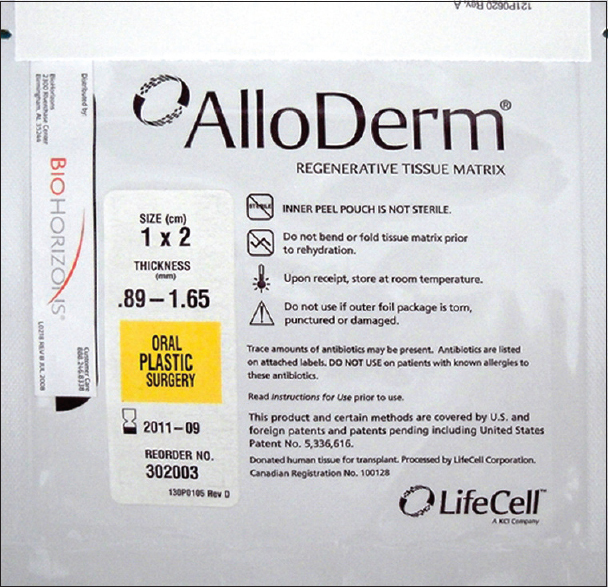 After procuring the allograft aseptically from human donor skin, it was processed to remove the epidermis and cellular components of the dermis to maintain the basement membrane and the extracellular matrix., Alloderm has advantages such as unlimited supply of the allograft, no need of second surgical site, limits postoperative morbidity, nonimmunogenic, available in various sizes, shelf life of 2 years, and saves time for the operator and the patient. 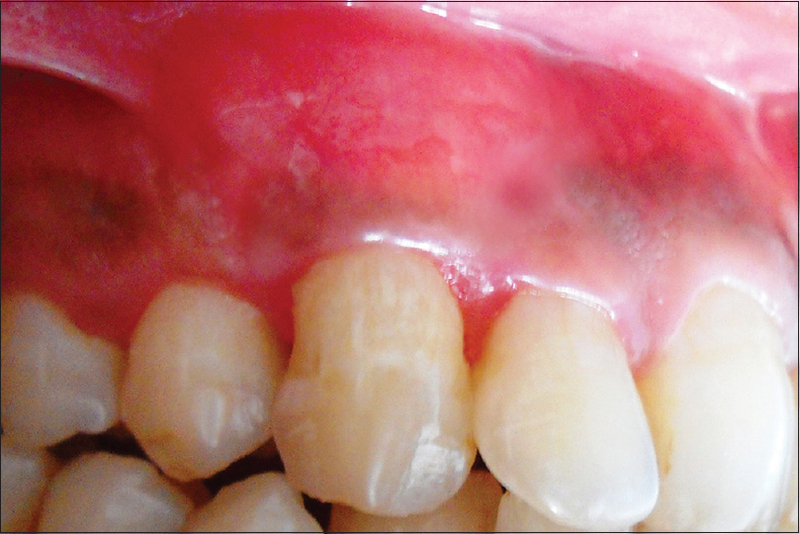 This study was done to assess the efficacy of Alloderm in the treatment of isolated Miller's Class I or Class II gingival recession. 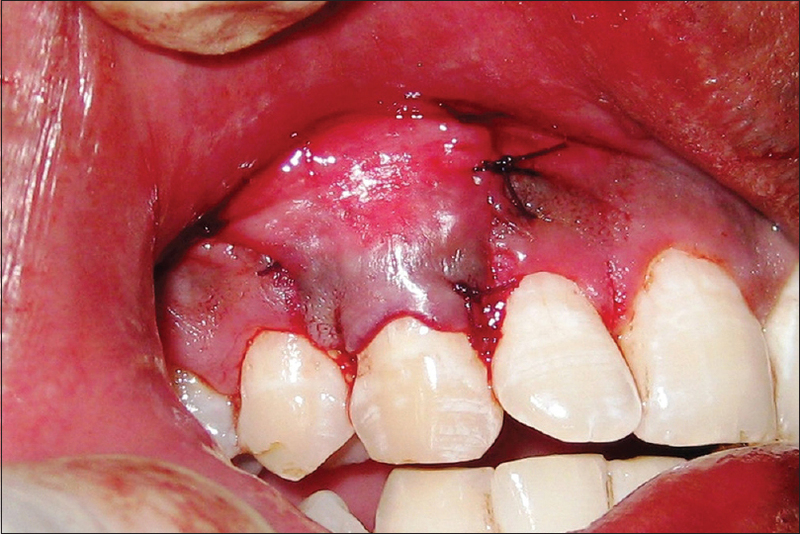 Case selection was based on the Miller's classification of gingival recession which is crucial to the predictability of the surgical outcome as adequate blood supply from the tissues adjacent to the graft bed is one of the most important factors for the survival of the grafted tissue over the avascular root surface. Patients with Miller's class I or Class II gingival recession defects were treated in the study. Following the inclusion of patients based on selection criteria, all clinical parameters were measured at baseline, 3 months, and at 6 months postoperatively. The recipient site was prepared using coronally positioned flap and the graft was oriented with basement membrane facing the flap side and connective tissue side facing the tooth surface. This was based on the previous reports showing that the orientation of the material did not affect the treatment outcome. The mean RH was reduced at 6 months postoperatively from the baseline of 2.5 mm which was statistically significant. In a previous study group, a mean recession depth reduction of 4.12 mm was seen for coronally advanced flap technique. This difference in the mean reduction can be explained based on the selection of the size of the defect site. In the present study, recession was in the range of 2–3 mm whereas in the group selected in the previous study, RH was 3–8 mm. The results of the present study compares well with the long-term study conducted  in terms of RH reduction which was within the range of 0–3 mm. The mean RW was reduced from 4 mm to 0.4 mm from the baseline to 6 months with an increase of 91%. The reduction in RW was within the range of the results obtained in a previous study. Probing depth reduced from 1.5 ± 0.53 mm at baseline to 1.3 ± 0.48 mm at 3 months and slight reduction to 1.1 ± 0.32 mm at 6 months which shows significant statistical difference. Similar findings were found in the previous study  where probing depth was reduced. The mean gain in clinical attachment level of 4.0 mm from the baseline to 6 months was found to be statistically significant. In a previous study, they compared CAF with Alloderm and found gain in CAL from 1.5 mm to 4.5 mm. The mean increase in KTH was 2.5 mm at 6 months from the baseline of 6.1 mm which was statistically significant. A previous study  reported 2.13 mm gain of keratinized gingiva at 1-year postoperative using ADM. Despite the small number of patients treated for recession defects, a significant amount of root coverage was achieved when ADM was used with coronally positioned flap after 6 months. Sites treated with ADM graft had a mean defect coverage of 89% which was comparable to previous results of 83.2%, 89%, 91.2%, and 93.2%, which indicates that data was reproducible. Statistically significant improvement in root coverage with ADM in our study might be due to the presence of collagen, which forms a major portion of ADM graft extracellular matrix. It was found that collagen stimulates platelet attachment, enhances fibrin linkage, and is chemotactic for fibroblasts. It also inhibits the apical migration of epithelium, allowing undifferentiated mesenchymal cells to repopulate the space and promote regeneration resulting in a stable attachment of covering flap to the preciously denuded root surface, thus preventing subsidence of epithelium. During the healing period, the ADM graft might have acted as a shock absorber, deflecting the undue forces that otherwise would be transmitted to the fragile maturing fibrin clot on the root surface. In this manner, ADM graft facilitates better tissue maturation, resulting in long-term root coverage. The ability of the ADM graft to increase flap thickness was another factor that might have contributed to the success. Although we did not measure flap thickness preoperatively and postoperatively, the possibility of increased flap thickness using the ADM graft cannot be ruled out. The increase in thickness might be due to integration of the ADM graft membrane with the overlying flap. It is not only the material or technique used that was critical for the success of treatment, other conditions must also be analyzed, including clot stability, plaque control, maintenance therapy, type of flap, post surgical antibiotic therapy, thickness of the graft, characteristics of the incisions, orientation of the graft, and systemic health. Adequate blood supply from the tissues adjacent to graft bed seems to be an important factor for the survival of the grafted tissue over the avascular root surface. The shortcomings of this study include the small sample size, short-term follow-up period, and lack of control group. Further, controlled clinical trials with demonstration of the type of attachment are needed to assess the predictability of root coverage using ADM with CAF. 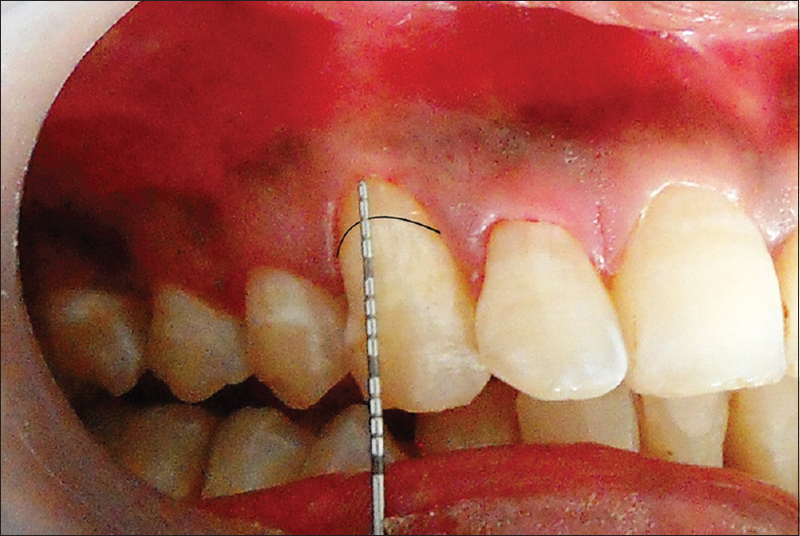 Within the limitations of the study, it can be concluded that the coronally positioned flap with acellular dermal matrix graft was effective in treating localized Miller's Class I or Class II isolated gingival recessions. Successful results were achieved in terms of increase in keratinized tissue height and percentage of root coverage. Glossary of Periodontal Terms, American Academy Of Periodontology. 4th Edition. 2001. Tözüm TF, Keçeli HG, Güncü GN, Hatipoğlu H, Sengün D. Treatment Of Gingival Recession: Comparision Of Two Techniques Of Subepithelial Connective Tissue Graft. J Periodontal 2005;76:1842-8. Felipe ME, Andrade PF, Grisi MF, Souza SL, Taba M, Palioto DB, et al. Comparison of two surgical procedures for use of the acellular dermal matrix graft in the treatment of gingival recessions: A randomized controlled clinical study. J Periodontol 2007;78:1209-17. Aichelmann-Reidy ME, Yukna RA, Evans GH, Nasr HF, Mayer ET. Clinical Evaluation Of Acellular Allograft Dermis For The Treatment Of Human Gingival Recession. J Periodontol 2001;72:998-1005. Gapski R, Parks CA, Wang HL. Acellular Dermal Matrix for Mucogingival Surgery: A Meta-Analysis. J Periodontol 2005;76:1814-22. McGuire MK, Nunn ME. Evaluation of the Safety And Efficacy Of Periodontal Applications Of A Living Tissue-Engineered Human Fibroblast-Derived Dermal Substitute. I. Comparison to the Gingival Autograft: A Randomized Controlled Pilot Study. J Periodontol 2005;76:867-80. Tal H. Subgingival Acellular Dermal Matrix Allograft For The Treatment Of Gingival Recession: A Case Report. J Periodontol 1999;70:1118-24. Fowler EB, Breault LG, Rebitski G. Ridge Preservation Utilizing an Acellular Dermal Allograft and Demineralized Freeze-Dried Bone Allograft: Part II. Immediate Endosseous Implant Placement. J Periodontol 2000;71:1360-4. Huang LH, Neiva RE, Soehren SE, Giannobile WV, Wang HL. The Effect Of Platelet Rich Plasma On The Coronally Advanced Flap Root Coverage Procedure: A Pilot Human Trial. J Periodontol 2005;76:1768-77. Andrade PF, Felipe MEMC, Novaes Jr. AB, Souza SLS, Taba Jr. M, Palioto DB, et al. Comparison between two surgical techniques for root coverage with an acellular dermal matrix graft. J Clin Periodontol 2008;35:263-9. Scarano A, Barros RR, Iezzi G, Piattelli A, Novaes AB Jr. Acellular dermal matrix graft for gingival augmentation: A preliminary clinical, histologic and ultrastructural evaluation, J Periodontol 2009;80:253-9. Santos A, Goumenos G, Pascual A. Management of gingival recession by the use of and Acellular Dermal Graft material: A 12 case series. J Periodontol 2005;76:1982:90. Camargo PM, Melnick PR, Kenney EB. The use of free gingival grafts for aesthetic purposes. Periodontology 2000;27:72-96. Henderson RD, Greenwell H, Drisko C, Regennitter FJ, Lamb JW, Mehlbauer MJ, et al. Predictable Multiple Site Root Coverage Using an Acellular Dermal Matrix Allograft. J Periodontol 2001;72:571-82. Pini Prato GP, Baldi C, Nieri M, Franseschi D, Cortellini P, Clauser C, et al. Coronally advanced flap: The post-surgical position of the gingival margin is an important factor for achieving complete root coverage. J Periodontol 2005;76:713-22. Harris RJ. A Short Term And Long Term Comparison Of Root Coverage With An Acellular Dermal Matrix And A Subepithelial Graft. J Periodontol 2004;75:734-43. Harris RJ, Harris AW. The Coronally Positioned Graft With Inlaid Margins; A Predictable Method To Obtain Root Coverage Of Shallow Defects. Int J Periodontal Restorative 1994;14:229-41. Paolantonio M, Dolci M, Esposito P, D'Archivio D, Lisanti L, Di Luccio A, et al. Subpedicle acellular dermal matrix graft and autogenous connective graft in the treatment of gingival recessions: A comparative 1 year clinical study. J Periodontol 2002;73:1299-307. Tal H, Moses O, Zohar R, Meir H, Nemcovsky C. Root Coverage of Advanced Gingival Recession: A Comparative Study between Acellular Dermal Matrix Allograft and Subepithelial Connective Tissue Grafts, J Periodontol 2002;73:1405-11. Harris RJ. Acellular dermal matrix used for root coverage: 18 months follow up observation. Int J Periodontol 2002;22:156-63. Sableman E. Biology, biotechnology, and biocompatibility of collagen. In: Williams DF, editor. Biocompatibility of Tissue Analog. Boca Raton, FL: CRC; 1985. pp 27. Wang HL, O'Neal RB, Thomas CL, Shyr Y, MacNeil RL. Evaluation of an absorbable collagen membrane in treating Class II furcation defects. J Periodontol 1994;65:1029-36. Mahajan A1, Dixit J, Verma UP. A patient centered clinical evaluation of acellular dermal matrix graft in the treatment of gingival recession defects, J Periodontol 2007;78:2348-55. Camargo PM1, Melnick PR, Kenney EB. The use of free gingival grafts for aesthetic purposes. Periodontology 2000;27:72-96.